Denmark coach Age Hareide said his team did what needed to be done to earn a point in a lacklustre 0-0 draw with Group C winners France yesterday and advance to the World Cup Round of 16 where they face Croatia on Sunday night. It was the first goalless draw after 36 matches at the World Cup, with neither France nor Denmark even remotely interested in attacking as the point suited both and left Australia, who lost to Peru in the other game, out of contention for a top-two finish. "We just needed one point, right?" Hareide said. "We were up against one of the best counter-attacking teams in the world. We would have been stupid if we opened up. We played to get the result and we did it." Fans from both sides started whistling and jeering as the game drew to a disappointing close. "You need to do what you need to do but for the team this has been wonderful. 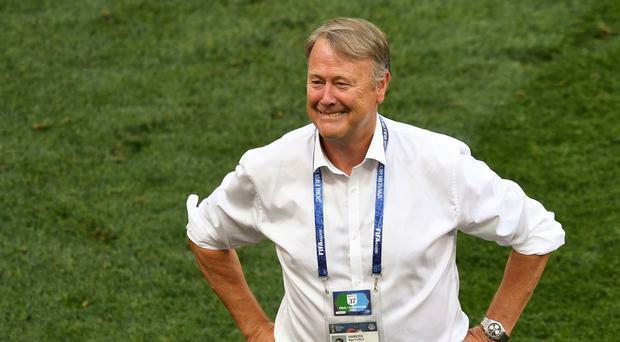 Our goal was to come here and to progress to last 16," Hareide said. "We had a tough group, one of the toughest I believe. The team that got three points (and did not qualify), Peru, played the best football," Hareide added. "We sacrificed everything to get the point and take us to the next level." Hareide admitted Croatia were the team others want to avoid. "They are really very good, really, really good," Hareide said. "They are very strong."